Rivers can be a barrier to cycling, but fortunately most bridges in the Netherlands can also be used for cycling. With many rivers flowing from the European mainland to the North Sea, the Netherlands really is a delta. Most rivers are large and they flow from east to west, dividing the country in a north part and a south part that are quite different from each other. It took a long time before these rivers could be crossed by land traffic. The first bridge over the river Waal, that was built under the State Plan for National Highways from 1927, was the Waalbrug at Zaltbommel. Opened in 1933, it was considered so important that a commemorative text was placed on the bridge that read “North and South United”. A bit odd, because the bridge was built right next to the railroad bridge, that had united north and south since 1869 already! That only shows how much people valued road traffic over anything else. That first bridge was replaced in 1996, but you can also cycle well on the new bridge. The two bridges over the river Waal as seen from Zaltbommel. The 1996 bridge is a cable-stayed bridge. 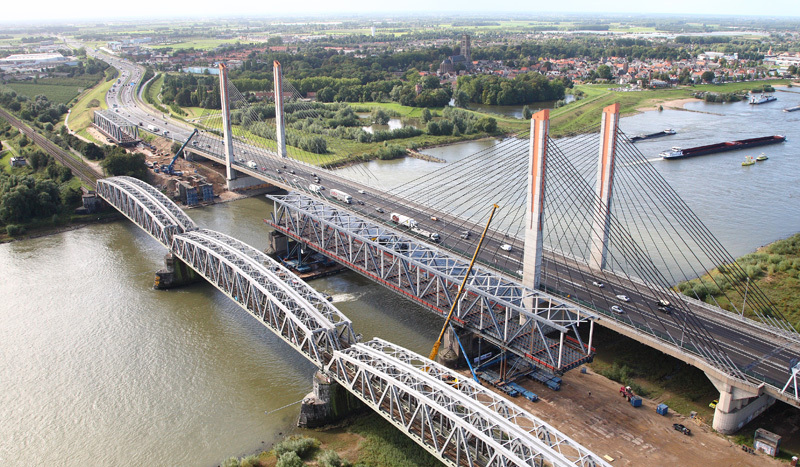 It is 990 metres long and the main span over the river Waal is 256 metres. The bridge deck is 38.84 metres wide. The bridge was built from September 1992 to January 1996, right next to the old bridge, at a cost of 90 million Guilders (40.8m euro). In January 1996, the motorway A2 was connected to the new bridge. The road has 2×3 lanes on the bridge and it now carries 133.600 vehicles per (week)day. A separate smaller road on the west-side of the bridge can be used by traffic that cannot reach the minimum speed on the motorway (70km/h or almost 45mph). This means that that two-lane road is used for cycling, mopeds and scooters, and agricultural vehicles. The video shows that the latter can be very large and intimidating. Fortunately, there are far more people cycling than there are tractors, so most of the time you will not encounter one. Even if you do, there is more than enough space for a cyclist and a tractor to pass, it just doesn’t feel very nice. The road for ‘slow’ traffic is not only used for cycling, agricultural traffic also has to use it, because that is not allowed on the motorway. This large vehicle was quite intimidating, but luckily there aren’t many such vehicles crossing the bridge. 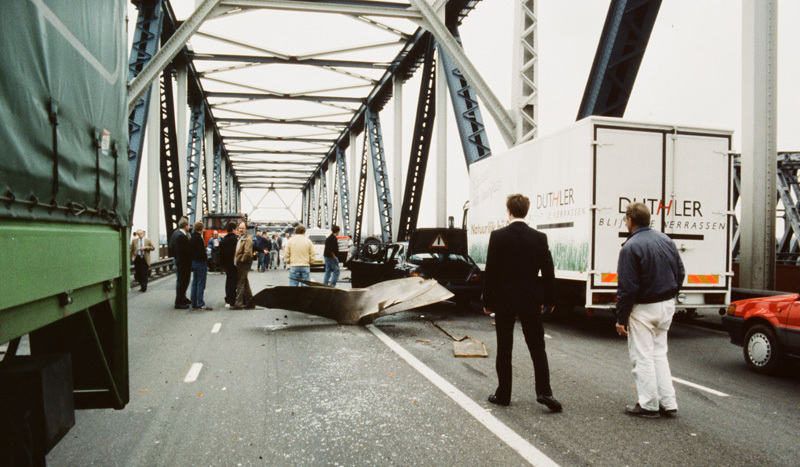 The new bridge is called “Martinus Nijhoffbrug”. Martinus Nijhoff was a Dutch poet and essayist. 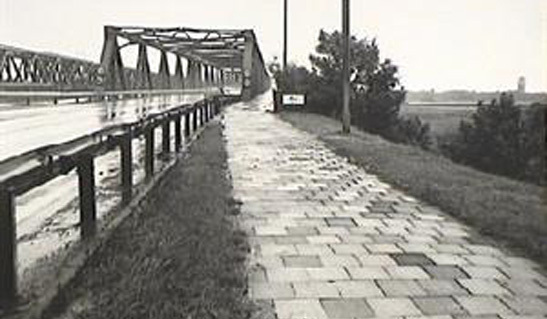 In 1934 he wrote a sonnet that mentions the first bridge at Zaltbommel. Another sign of how special that first bridge was. For hundreds of years the only way to get across the river was by ferry. After the bridge was opened in 1933, it was finally possible to get across the river in a much shorter time. A mere 219 cars per day used the bridge in those days. The road was used by all sorts of traffic, not just cars. It was built under the scheme to upgrade the Dutch road network. That 1927 plan categorised roads. For the highest category the specifications were two lanes for motor traffic (one in each direction) of 5.5 metres wide and separate cycle paths on both sides of the road, also one for each direction. Most new main roads in the 1930s were built like that. Separated cycling infrastructure was very common in the countryside, much earlier than in the towns and cities. And already at that time they were studied and praised abroad. The 1932 plan was a revised version of the original 1927 plan. It is clear that many bridges were needed to create just 4 routes from north to south. 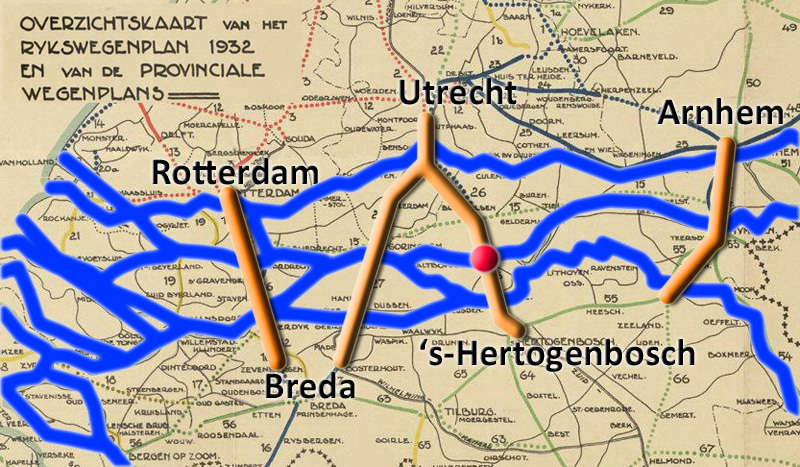 There had not been any land routes across the rivers before these routes were built in the early 1930s. This project provided a lot of work during the crisis years. At the red dot the bridge near Zaltbommel. I emphasised the larger rivers. 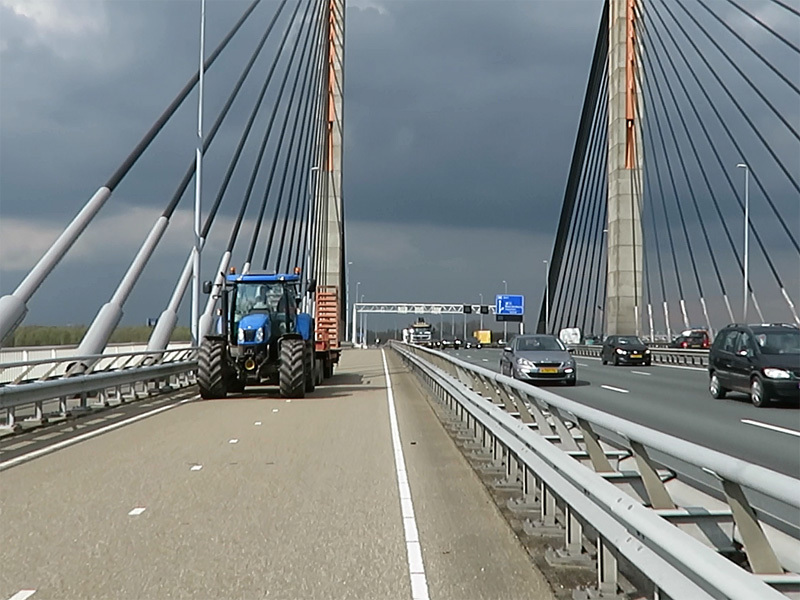 The deck of the bridge near Zaltbommel was only 12.3 metres wide and in the years to come that space would be used for 4 very narrow lanes without a centre median. The maximum speed was 70km/h but with 80,000 vehicles a day, in the 1990s, it was a very dangerous situation. Luckily cycling was possible on separated cycle paths. There was one for each direction on either side of the bridge. These cycle tracks were 2 metres wide. I can remember how scary it was to drive on this bridge. Most notably when I moved from Utrecht to ʼs-Hertogenbosch in 1995 and I had all my belongings in one rental truck, that I was just allowed to drive with my type of driver’s license. I was very much aware of the risk of losing everything I owned if something would have gone wrong there at that bridge. Luckily it didn’t go wrong. I found a video of that year which shows what it was like. That drive was filmed 6 days after mine. The old road bridge was demolished in 2007. First it was hoped it would be re-used. Wild plans to ship it to Surinam were abandoned and all other plans failed as well. In the end the scrap metal didn’t even cover the demolition costs. 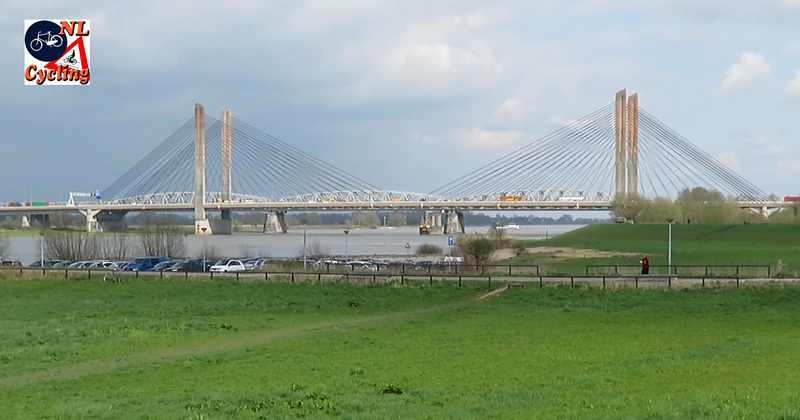 The new bridge has not yet reached that mythical status, but it is a very well-known landmark all the same. 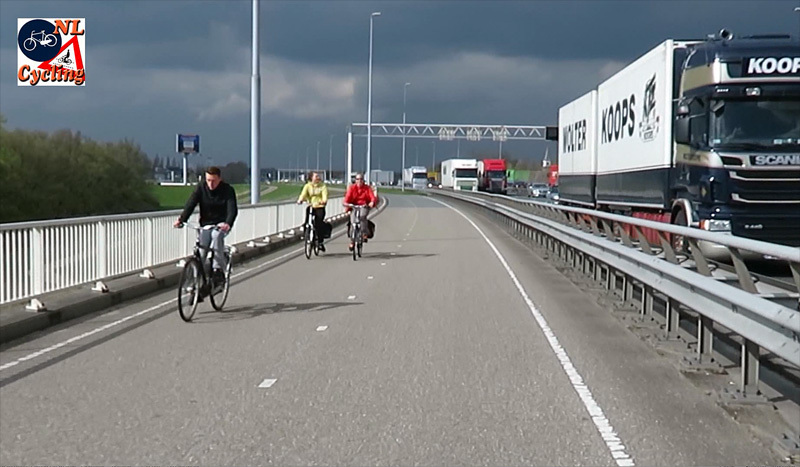 It is also a nice example that even motorway bridges can be made accessible for cycling. People cycling on the north access ramp right next to the 6-lane A2 motorway with very heavy motor traffic. Not the nicest place to cycle, but the path is only this close to motor traffic on the bridge itself. The two types of traffic are led away from each other on either side of the bridge. I am not sure, but that sounds like you’re ignoring the railway-bridge like the car-enthusiasts did in the 1930ies. Very interesting post as always though! I wonder if the considered keeping the old bridge in place, and using it as a cycle lane? Yes, that was also one of the plans with the old bridge that didn’t make it. Oh, so you don’t have the ability to rent a train carriage to ship your piano or television or whatever you owned back then? And when you said 2 lanes 5.5 metres, did you mean 5.5 metres each or 2.75 metres per lane for 5.5 total? The 5.5 metres will indeed be a total of 2.75m per lane. But these were the early 1930s specifications. Today’s measurements are different. For a motorway the widths are now 3.5m (for speeds of >=120km/h) or 3.25m (for 100km/h). The 2.75m is today generally used in the built-up area for a neighbourhood access road of the 2×1 lane road type. Which is very narrow compared to the rest of the world. How do the buses fit I wonder, they are almost as wide as the lane, 2.6 metres (I love the metric system, no 9 foot whatever lane containing a 62 foot long 8 foot something wide truck). This entry was posted on 13 September 2016 by Bicycle Dutch in Original posts and tagged big bridge, history, Motorway, ride, Zaltbommel.